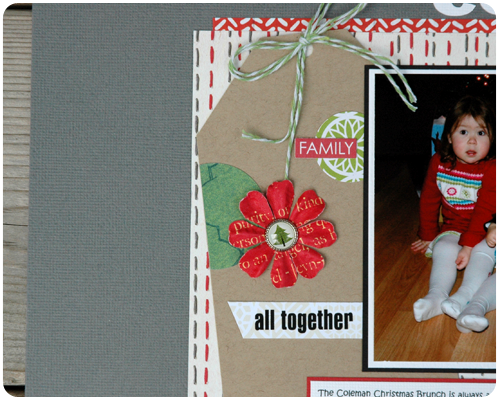 Working on my Christmas 2012 layouts in one huge batch has been awesome. I pulled out all of my Christmas paper and embellishments and just went to town laying out my pages. Some pages came together rather quickly, while others took a few days to be done. As I worked, I moved from page to page as I was inspired, and in the end this allowed me to get a huge amount of scrapbooking done. That being said, I have nearly depleted my Christmas embellishments and will need to purchase new ones for this year. Tragic, I know. Today I would like to show you a layout I did of my girls with their cousins at our Christmas Brunch. 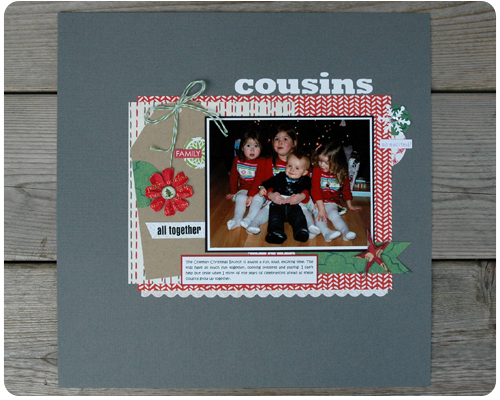 This is one of my favorite layouts - I love the patterned paper (from Studio Calico) and all the layering. I love the large tag (made by me) on the side of the photo, and that I used a flower on a Christmas layout. Oh, and the kids in the picture are pretty cute too. I hope you are enjoying all these Christmas layouts (click here, here, and here if you want to see the other Christmas layouts I have completed.) I have only one more layout to show you (next week probably) and then my 2012 album is complete. beautiful layout. love how you have tucked the embelishments inbetween the layers. Thanks Katie. I love layering papers - it is my new favorite scrapbooking technique. Love the layout, Rachel. The tag is beautiful. The kids are adorable!!! Thanks for sharing. Have fun buying new Christmas embellishments. I have tons of Christmas pictures to scrap/ Want to do mine? lol. Thanks Leslie. I am really looking forward to buying some new Christmas supplies...so fun. Good luck with scrapping your Christmas pictures.